The day Corbyn took over as Labour leader I posted a chart of how his predecessors had done in their first 12 months, so we could compare polling of Labour during Corbyn’s first year. Every three months I’ve checked in on progress (here, here and here). Corbyn has been in charge of the party for a year and here is the last update in the series (methodological note below). 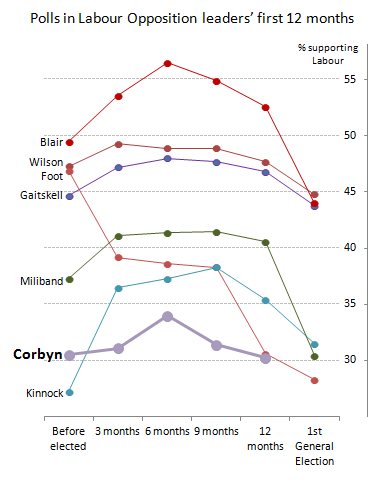 It shows that Labour is not the most unpopular it’s ever been at the end of a leader’s first year. Fewer people said they’d vote Labour in 2008 than say the same now. Labour has no less support now than it did after Michael Foot’s first year. You could argue either way about how badly the precedent suggests Corbyn’s doing. On the one hand, every other Labour leader who took over in opposition when it was polling below 40% (Kinnock, Smith, Miliband), finished their first year with it above 40%. Corbyn finishes his first year at around 30%. On the other hand, Callaghan, Foot and Brown all lost much more support in their first year than Corbyn did. So it’s hard to argue, using just this data, that he’s the most unsuccessful post-war leader. The comparison also suggests that the leadership challenge (which came between the 9- and 12-month points in this chart) has had little effect on voting intention. 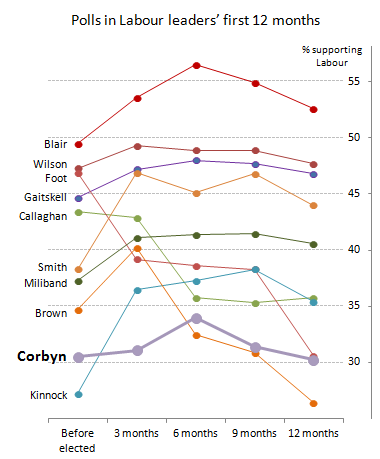 Polling of Corbyn’s Labour has followed a common historical pattern: gaining support in its first six months, then losing it in the second six (as did Gaitskell, Wilson, Kinnock, Smith and Blair). Given where Labour is now, how can it expect to do at the next election? A rule that has never been broken is that Labour oppositions always lose support between the end of their leader’s first year, and the general election. To show this, I’ve added each leader’s first general election result (Great Britain only) and taken out the leaders who took over as Prime Minister (Callaghan and Brown both gained support ahead of the election). This crudely suggests Labour is now on course for its worst-ever post-war election result: worse than Foot in 1983. While Labour now is doing better than it was under Brown, it recovered support ahead of the 2010 election, as UK governments always do. This means, to avoid doing worse than Foot, Labour under Corbyn will have to lose fewer voters between now and the election than any previous opposition leader has done. Methodology: I’ve been consistent with previous versions of this calculation. The most important note for this update is that, because there have been few polls recently I’ve included every relevant poll that’s been conducted over the last month, instead of just in the last two weeks as would normally be the case. That follows the methodology I used for previous data points. As previously, the score for how Labour’s doing today will be updated to include the new polls that come out in the next two weeks. This entry was posted on Sunday, September 11th, 2016 at 20:12	and is filed under Historical polls, Labour leadership, Politics. You can follow any responses to this entry through the RSS 2.0 feed. Both comments and pings are currently closed. ?????? ?? ????,???? ?????? ?? ????,???? ?????? ?? ????,???? ???????,???? ?????? ?? ????,???? ????? ?? ????,???? ????? ?? ????,???? ????? ?? ????,???? ????? ?? ????,????? ?? ??? ?